Launchy is a free windows and linux utility designed to help you forget about your start menu, the icons on your desktop, and even your file manager. Launchy indexes the programs in your start menu [and anywhere else] and can launch your documents, project files, folders, and bookmarks with just a few keystrokes! 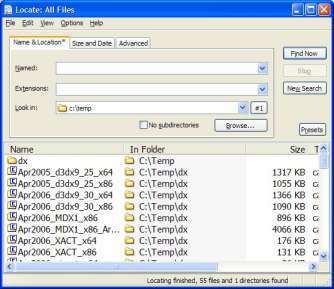 Locate32 is software which can be used to find files from your harddrives and other locations. It works like updatedb and locate commands in Unix based systems. In other words, it uses databases to store information about directory structures and uses these databases in searches. The use of these databases provides very fast searching speed. The software includes a dialog based application as well as console programs which can be used to both update and access databases. Supported operation systems are Windows 98/ME/NT4/2000/XP/Vista.